With the British Winter drawing in and the nights getting longer, what better way to get through a damp and chilly night in November then to curl up next to a fire with a glass of excellent rum. Now granted the fire at Portobello Road’s Trailer Happiness is more of a rum soaked flame show on the copper ceiling, but the warm atmosphere of the bar and the Tiki mad bar staff are just as good. Although relatively new to the UK market, Ron Botran is every bit a part of Guatemala’s history of rum production, which dates back over a hundred years. Of the four distilleries that make up Industrias Licoreras de Guatemala, the Botran family’s Industria Licorera Quezalteca was the last to be established in 1939. Migrating from Spain in the early part of the 20th century, the family brought the Spanish sherry production techniques with them to Guatemala. Initially making a name for themselves for their sugar cane production, the Botran family started producing rum using a technique similar to the production of sherry and called it “Sistema Solera”. 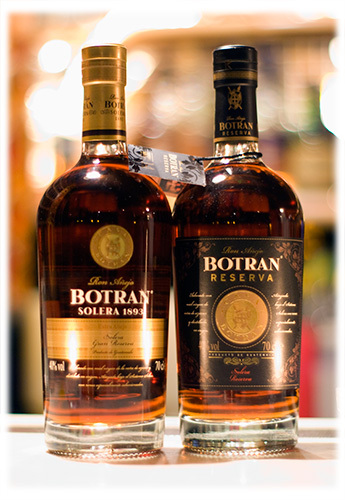 Unlike most other rums, which use either sugar cane juice or molasses, Botran uses virgin sugar cane honey, which still contains 72% – 76% of the sugar. This gives a much higher sugar content for fermentation, which is also unusual in that the fermentation period is approx 120 hours as opposed to the usual 24 – 72 hours for most other rums. This much longer fermentation period is possible due to the use of yeast derived from pineapples. Because of the unusually long fermentation process, more of the sugar is converted into alcohol, giving the resultant distillate from the column still a much fuller taste. As shown in the diagram below (courtesy of Rones de Guatemala), the distillate is then put into American whiskey barrels, that have previously been used in the production of Jack Daniels, where it is left to age. After a period of time, this aged rum is then married in a 400 liter intermediate vat with older rums, before it is put into re-charred American whiskey barrels to continue aging. Before final marrying, the last vat of blended intermediate rum is then put into either ex-port barrels or ex-sherry barrels and aged for a period of time to impart additional flavours. Finally and depending on which Botran rum is being produced, the final marrying will take a blend of rums from the port barrels, sherry barrels and older lots of previously aged rum. Reserva -A Solera blend of rums aged between 5 and 14 years, using some sherry barrel aged rum, with a larger proportion of port aged barrels. 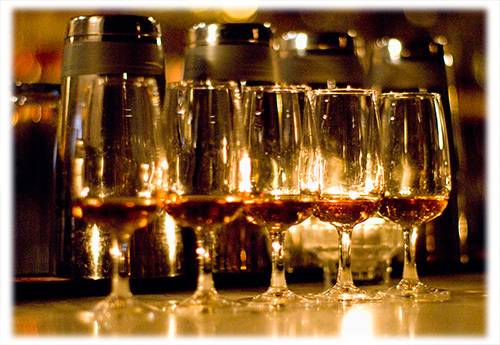 This is a complex, dry, slightly woody rum with hints of chocolate, almonds and caramel. Although smooth to start, it still has a slightly peppery bite on the finish. This makes for a great pouring rum, while still being approachable enough to sip. Solera 1893 – Again and as the name suggests, a Solera blend of rums aged between 5 and 18 years, but using a higher proportion of blend from the sherry barrels. This is sweeter and richer in taste and makes for an excellent sipping rum. Like the Reserva, it has aromas and tastes of chocolate and caramel, but also has notes of dried mixed fruit. To finish the evening’s tasting off, Maya treated us to a little trick she’d been taught by the guys and girls at the distillery and had Francis pour us all out a measure of chilled Solera 1893. Knowing that the addition of ice to neat rum often makes it easier to drink, due to both the chilling effect and the dilution, it didn’t come as much of a surprise that chilling this particular rum made it even easier to sip. 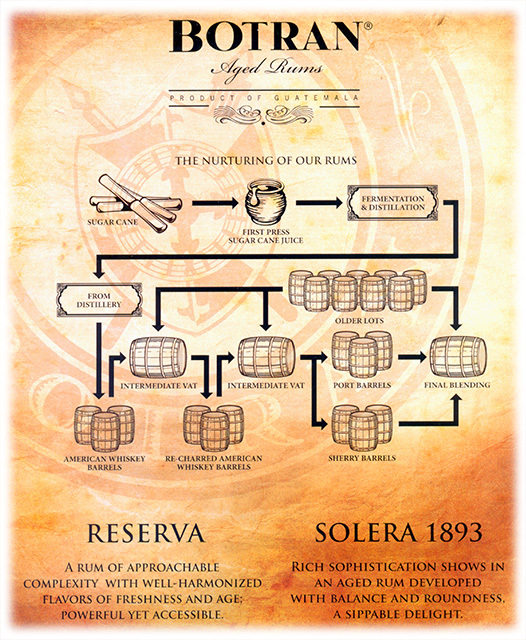 Both the Reserva and Solera 1893 are bottled at 40% ABV / 80 Proof. With both rums being aged for a minimum of 5 years and using the same production techniques, it’s fundamentally the time spent aging in the sherry and port barrels along with the proportion of each in the final blend that sets these rums apart from each other. Today, Industrias Licoreras de Guatemala is responsible for the production of Ron Botran, Ron Zacapa, the bulk rum used in Plantation’s Gran Añejo Rum, as well as several other rums and spirits from Guatemala. So with Maya having finished her wonderful impersonation of Jackanory, the more astute among you may be wondering what happened to the Dominican Monks, the tales of adventure on volcanic shores and what either of these things have to do with Guatemala rum production. In a nutshell, if it wasn’t for the Dominican Order of Monks, who it is believed first took sugar cane and planted those same canes in the fertile volcanic soils of Guatemala, we probably wouldn’t have the rums of Industrias Licoreras de Guatemala. So next time you’re drinking Ron Botran, Ron Zacapa or Plantation Gran Añejo Rum, remember to raise your glass and offer a toast to those Dominican Monks. As usual, my thanks to Max and Damien for yet another great Rum Club and to Distillnation’s Maya and Francis for a great evening with Ron Botran. The next London Rum Club is scheduled for Monday the 5th December and will be featuring Shervene Shahbazkhani, the UK Bacardi Brand Ambassador, along with some of their fine rum. For those interested in learning more about the London Rum Club, please either visit the website or pop into Trailer Happiness and speak to the bar staff.